Perhaps the most prevalent method of making herbal extracts for ingestion are simple, yet highly effective, tinctures. 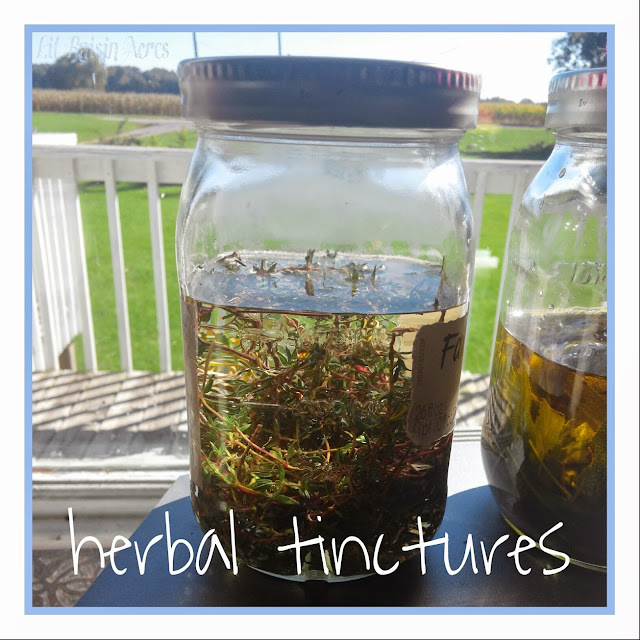 Tinctures can be made using either vinegar or alcohol. Alcohol is generally accepted as the better, more potent choice for medicinal purposes. However, the vinegars are very versatile and can be used for culinary purposes as well. If you plan on primarily using your tinctures to treat small children medicinally, use vinegar. Stuff plant material into a clean glass jar. Pour chosen solvent into jar, enough to cover your plant material by an inch or two. Place the jar in a sunny window for approximately 4 to 6 weeks. Strain the plant material out of the solvent with cheesecloth and store your tincture in a small (preferably dark colored) glass bottle in a dark, dry, cool place. You can easily dry your herbs using materials found around your home. I recommend this method of drying for large batches, especially for woody stemmed plants. I have found that it's much easier to process large batches of herbs by air drying than by dehydrating, especially woody stemmed plants with small leaves like Thyme. Be advised though, air drying can take several weeks as opposed to a day in the dehydrator. Gather herbs together in small bunches by the stems and tie together with string, leaving ends 5-6" long. Tie ends of string to the coat hanger, letting the bunches dangle freely. Hang the coathanger in a dry, ventilated place away from direct sunlight. 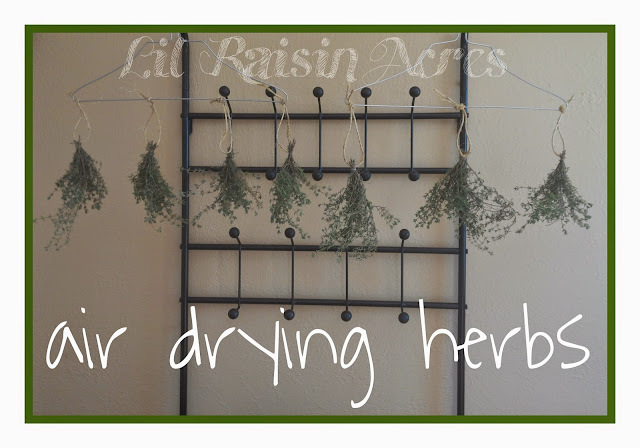 Allow herbs to hang until leaves are completely dry and crumble easily. Strip leaves from stems and store whole in a glass jar in a cool, dark, dry place. They store well for at least a year, after which they will begin to lose some potency. When you need to refill your pantry shaker, pour your dried herbs into a small blender or mortar/pestle and grind as needed. 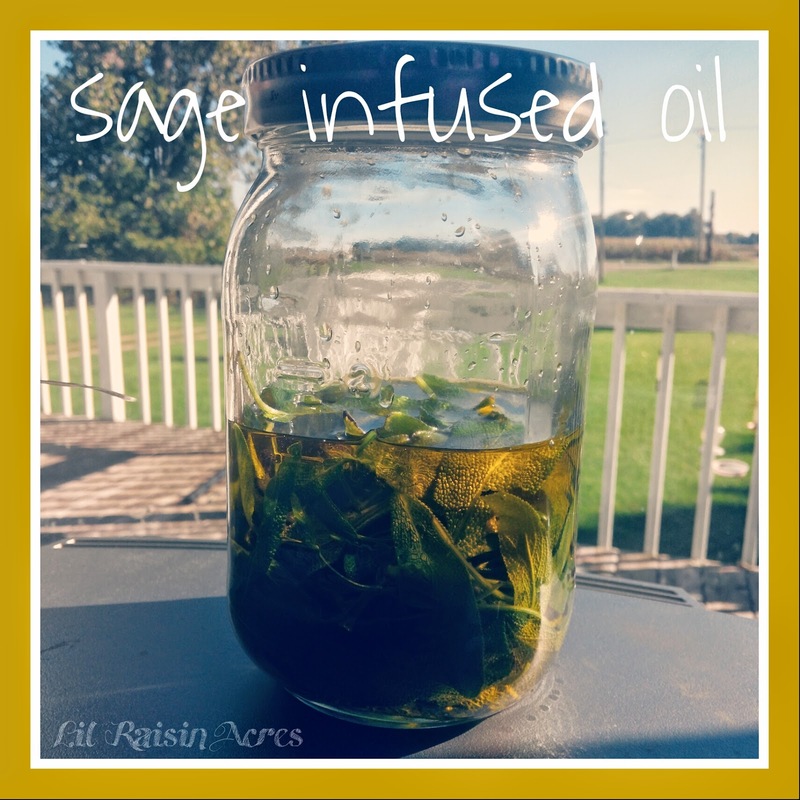 Making your own infused oils is incredibly simple, and can save you money! Herb infused oils are extremely versatile. They can be used medicinally internally, as well as in herbal soaps and lotions. 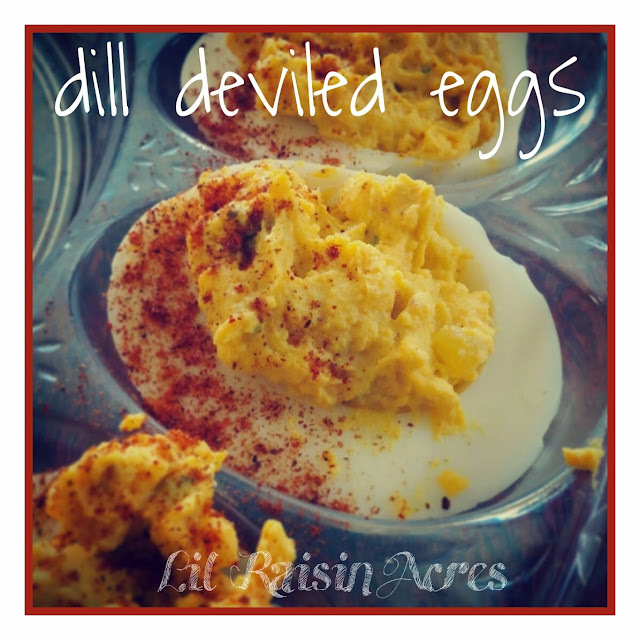 They are also great paired with vinegar for dressing salads! Pack a clean glass jar with plant material. You can use leaves that have been chewed on by insects and young stems that you may not want to dehydrate, too. Pour enough olive or coconut oil over the plant material to just cover it and close jar. Put the jar in the pan of water for about 10 minutes. Remove jar from water and place in a sunny window for two weeks, shaking the jar nightly. After two weeks, strain the plant material out of the oil using cheesecloth, and store your oil in a (preferably dark colored) glass bottle in a cool, dark place. Today marks the official last day of summer, although it's been feeling quite autumn-like here in southeastern Michigan since August, save a few days of "heat-wave" here and there. I took advantage of the sunny weather and went for my last walk of summer around the grounds here. Some photos around the grounds today. It seems like the leaves started turning from summer green to autumn yellow, orange and red a little early this year to me. Everything has gone to seed, the soy and corn crops are dying back and ready for harvest. Perhaps it's just the older I get, the faster time seems to fly, especially summer, my favorite season. Don't get me wrong, I enjoy the early days of autumn- there's still some gardening going on, the apple and herb harvests, and it's finally cool enough to comfortably use the canner. I love harvest style fall decorations- mums, pumpkins on straw bales, scarecrows, indian corn and unique gourds and squash. It's just that I know what's coming next LOL! 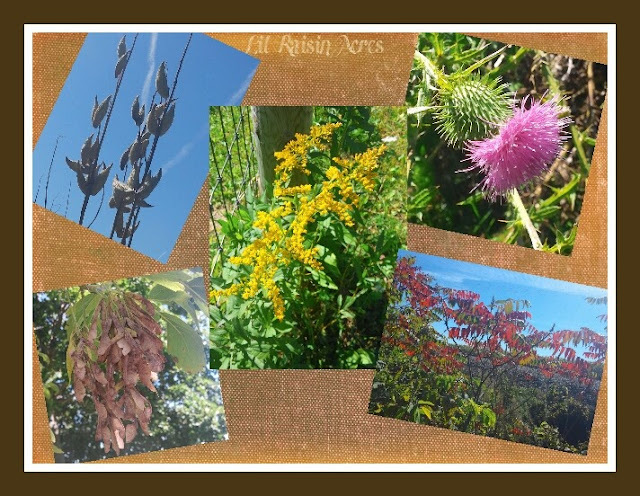 As for us, our autumn tasks will include final herb harvest and dehydrating, trimming Deenis and Baa's hooves, winterizing the coop and barn, and replacing glass stall windows with plexiglass before the cold hits. We are preparing for another winter like the last, and if it's not as harsh, excellent! If you live in the suburbs of metro Detroit or Toledo, but are looking to enjoy the autumn harvest, locally there are some nice, affordable activities for families going on. Carpenter Farms in Adrian (on 223 just east of town) is open to the public for hayrides, a corn maze, and pumpkin and straw bale sales. There's also Apple Charlies in Huron selling apples, pumpkins, cider and donuts. What is autumn without apples and pumpkins? I'll be looking forward to all the decorations and festivities in the coming months. What is your favorite part of autumn? The food? The decor? The cooler weather? Let us know in the comments section below! At his "other job", Brian often comes across perfectly good items in need of a little TLC in the trash. With a little elbow "grease", literally, you can turn a rusty old cast iron pan into a like-new cooking machine! 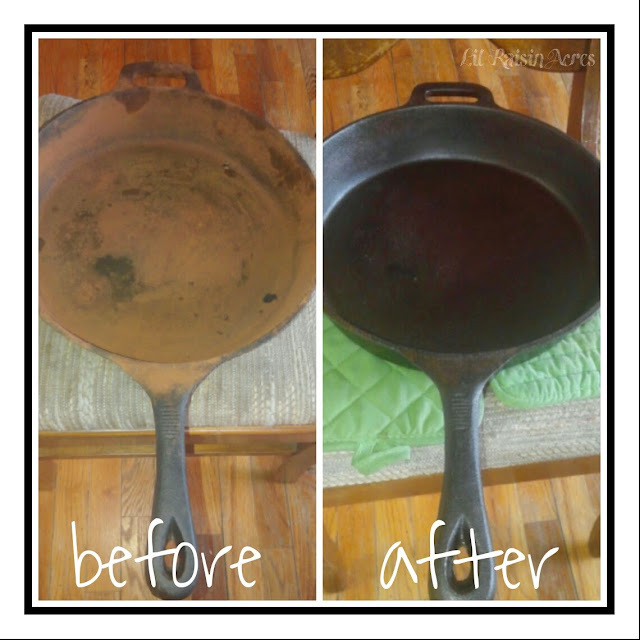 Reconditioning old cast iron pots and pans is simple, and can save you hundreds of dollars! Keep an eye out for them at garage sales or thrift stores. Properly seasoned and cared for, they are just as non-stick as teflon pans, without the toxic fumes and will last a lifetime! Preheat oven to 300 degrees. First, scrub the pan with a scouring pad to remove surface rust. You may need steel wool for more neglected items. Scrub until majority of surface rust has been removed and dry thoroughly. Next, rub entire surface with a light coating of lard and sprinkle garlic powder into the pan. Place the pan into the oven for 60 minutes. Allow the pan to cool and repeat the process. The pan will become blackened and is now ready to use! Once pan is "seasoned", do not wash it with water and dish soap, but rather wipe the pan out with a paper towel or dishrag while it is warm. This is a cold day favorite I've been making for years! It can be put together the night before, refrigerated, and put on in the morning. There are several variations and substitutions to suit individual tastes as well! *Can be substituted for Broccoli, use Cream of Broccoli Soup. *Can be substituted for Mushrooms, use Cream of Mushroom Soup. Mix potatoes, veggies, onions in bottom of crock. Place chicken on top of potatoes, pour soup over chicken and add spices. 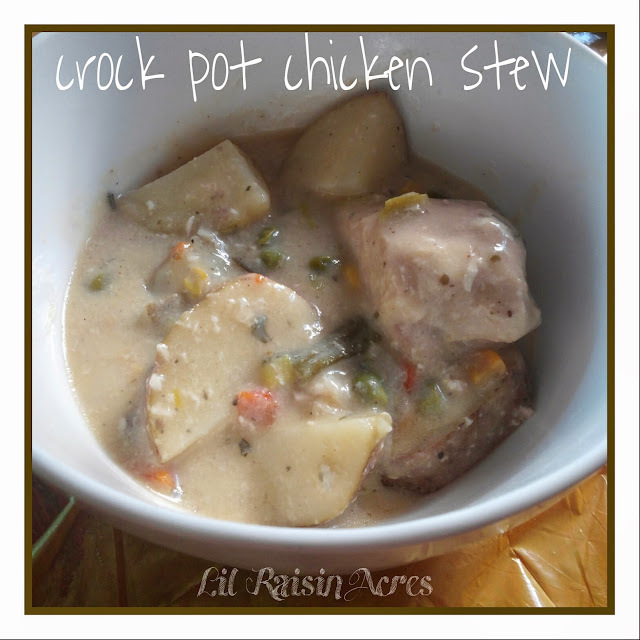 Cover and cook on LOW for 6-8 hours or until potatoes are tender and chicken is cooked through. Serves 4. What's spaghetti without meatballs? Make your own from self-harvested venison this coming hunting season. This recipe can be made ahead and frozen for convenience! Preheat oven to 400 degrees. Mix dry ingredients into meat, then add wet ingredients, mix thoroughly. 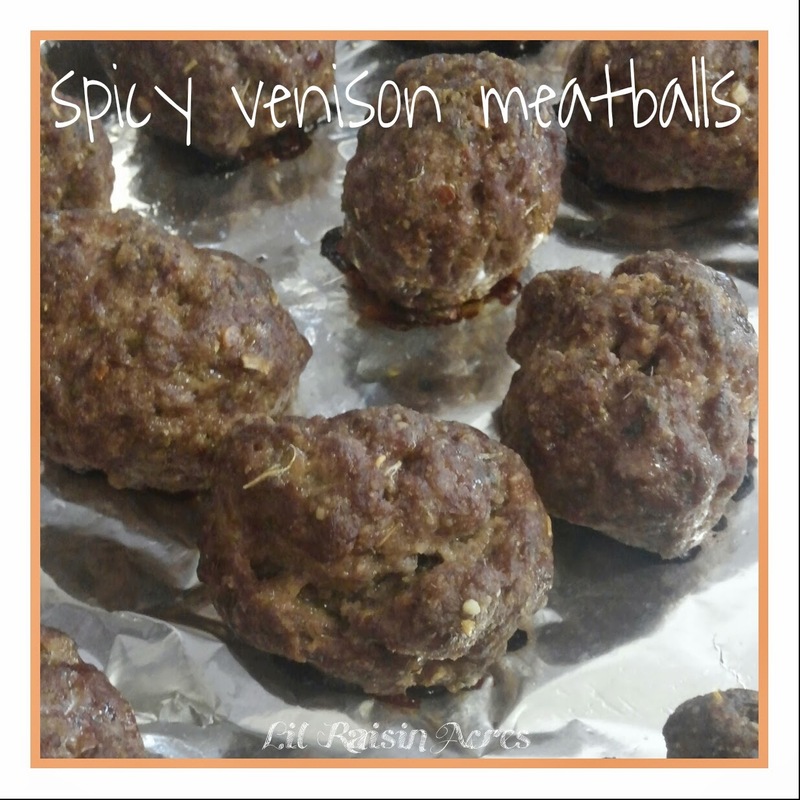 Form meat into tablespoon sized balls and place on a cookie sheet. Bake for 25-30 minutes or until inside is no longer pink. Makes appx. 36 meatballs. Now days, we associate Oregano with pizza and spaghetti, but it was once considered a symbol of happiness, good luck and good health! We now know it also has excellent infection fighting healing properties, and contains vitamins and minerals that strengthen the immune system. Oregano is a member of the mint family originating from the Mediterranean region. The name Oregano comes from the Greek words "oros" and "ganos" meaning "mountain joy". It appears quite often in folk lore and in historical medical texts. Considered a symbol of happiness, as well as a bringer of good luck and good health, brides and grooms were even crowned with it at ancient wedding ceremonies. After WWII, Oregano grew in popularity as a culinary herb in the United States as soldiers returned from Italy with a taste for pizza. Antiseptic, antibacterial, antiparasitic, antiviral, antioxidant, antihistimine and fungicide. It's most potent active ingredients are Thymol and Carvacrol. Other active ingredients include: Terpenes, Rosmarinic Acid, Naringin, Limonene, Pinene, Ocimene, Caryophyllene, and E-BCP. Oregano also contains Vitamins A, C, and E, calcium, magnesium, zinc, iron, potassium, manganese, naicin, fiber, and Omega 3s. Together, these substances make for a powerful immune system booster. Oregano has many uses. As an oil, it can be used to treat burns, cuts, athletes foot, and fungal infections. Taken internally, it can aid in fighting off infection (most notably respiratory ailments), soothes a sore throat, and aids in digestion. It can also be vaporized and inhaled to treat congestion. Oregano has also been used to successfully treat the waterborne infection Giardia, which is caused by parasites..
Oregano Tea: Pour 1 c. boiling water over 1 tsp. crushed dried leaves. Steep for 10 minutes. Do not strain before drinking. Oregano Healing Oil: Mix 10 drops Oregano Oil* into 2 Tbsp. Coconut or Extra Virgin Olive Oil. Apply to affected area liberally 3x per day. Oregano Steam Treatment: Add 1 Tbsp. of Oregano leaves to a bowl of steaming hot water. Place a towel loosely over your head and inhale steam. Oregano Antiseptic Cleaning Spray: Combine 2 drops Oregano Oil*, 5 drops Lemon Oil, 1/8 c. White Vinegar, 1 gallon water. Pour mixture into spray bottle. *Purchase Oregano Oil from a reputable supplier. Be sure your oil was obtained from "Origanum Vulgare" or the spanish "Thymus Capitatus". Or, make your own- See below! Oregano is a hardy perennial in USDA Hardiness Zones 5-10. It can be grown from seed sown outdoors after danger of frost has passed, or from stem cuttings. Seed should be sown on the soil surface in full sun. Seed germination, depending on soil temperature, is roughly 14-21 days. Thin seedlings to 12 inches apart. Soil should be well drained and nutrient rich. Oregano can be grown in a container with proper drainage and brought indoors to overwinter in cooler climates. It can be overwintered outdoors by mulching with straw or fallen leaves. Divide older plants when they become too woody or begin to die in the center. Use pruning shears to cut back stems to the ground and remove leaves for fresh use. Never cut back more than 2/3rds of the plant. You can dry the leaves by either hanging the stems with leaves in tact in loose bunches in a dry, ventilated area away from direct sunlight, or by removing the leaves from the stems and placing them in a dehydrator set to 95 degrees for about 8-10 hours. Oregano can be frozen by packing ice cube trays with chopped leaves and pouring water or oil over them, but I only recommend this method if you intend on using it for soups, sauces or stews. 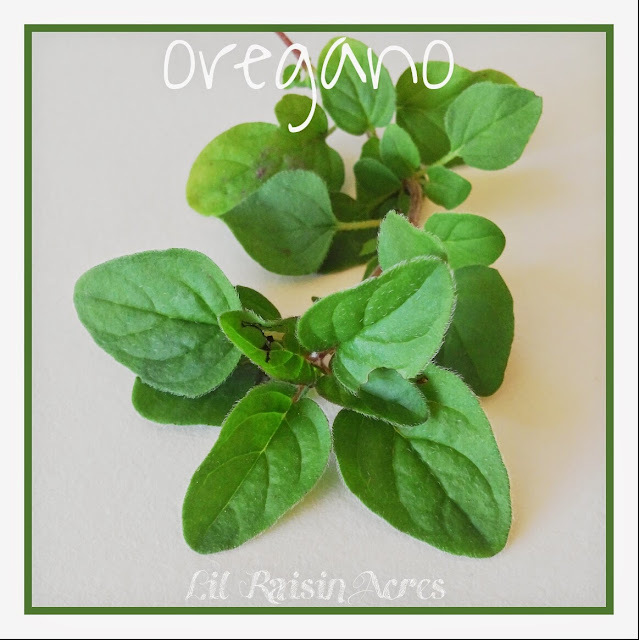 DIY Oregano Oil: To make your own Oregano Oil, pour olive or coconut oil over a jar full of fresh oregano leaves. Place the jar in a pan of boiling water for 10 minutes. Place the jar in a sunny window for 2 weeks. Shake the jar once daily. 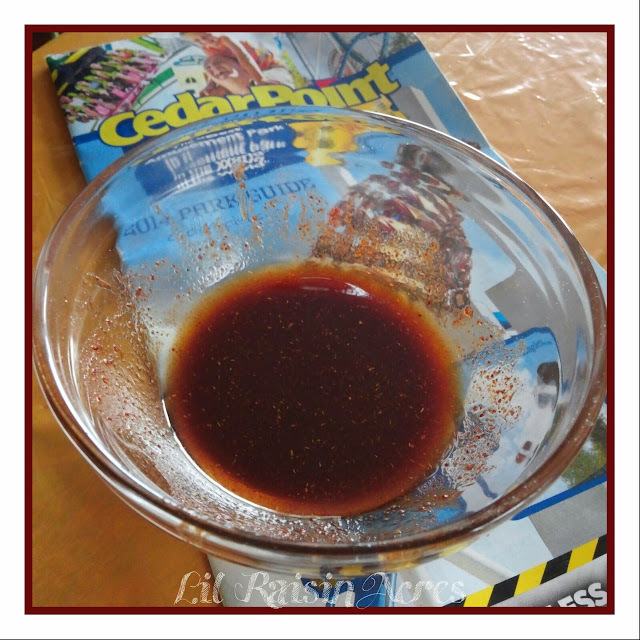 After 2 weeks, strain the oil and store in a dark colored bottle in a dark, dry place. **SAFETY PRECAUTIONS: Pregnant women should avoid Oregano Oil. Dilute Oregano Oil before using on skin. Anyone inviting me to a picnic or holiday party already knows what I'll be bringing! I've been making these eggs for several years now, they're always gone by the end of the evening. Slice eggs lengthwise, reserving yolks aside in a mixing bowl. Mash yolks with a fork and add remaining ingredients, except Paprika. Mix well, until filling is fairly smooth and creamy (if the filling is a little dry, you may add more mayo). Fill the yolk depression in each egg white with filling. Sprinkle lightly with Paprika and serve. *If you make them more than a few hours beforehand, be sure to cover them well with wax paper or foil. The fillings will dry out and become "crusty". This past weekend, we went to Cedar Point. It was my first trip back since I was about 15 years old. It certainly looked much different than I remember, but even more so, was the difference in the soreness the next day! Here's a simple little home remedy alternative to Tylenol or Ibuprofen for those sore shins, calves and ankles! Mix cayenne powder into carrier oil thoroughly til a paste is formed. Rub cayenne oil into sore muscles and joints. Takes roughly 10 - 15 minutes to activate. You will notice a warming/tingling sensation. Re-apply when necessary. *Wear gloves or wash hands immediately after application, avoid touching eyes. *DO NOT USE on areas with open wounds. *Cayenne may stain fabrics, apply carefully! CAYENNE: External and internal pain reliever, analgesic, antibacterial, rubefacient. Cayenne's high concentration of salicylates (Capsaicin) is believed to decrease the concentration of the chemical "Substance P" used by nerve cells to transmit pain signals. Improves circulation, dialating capillaries by both topical and internal doseages. Can also be used long-term to treat arthritis and fibromyalgia pain. The effectiveness of increases over time. ***All information is intended for your general knowledge only and is not a substitute for medical advice or treatment for specific medical conditions. 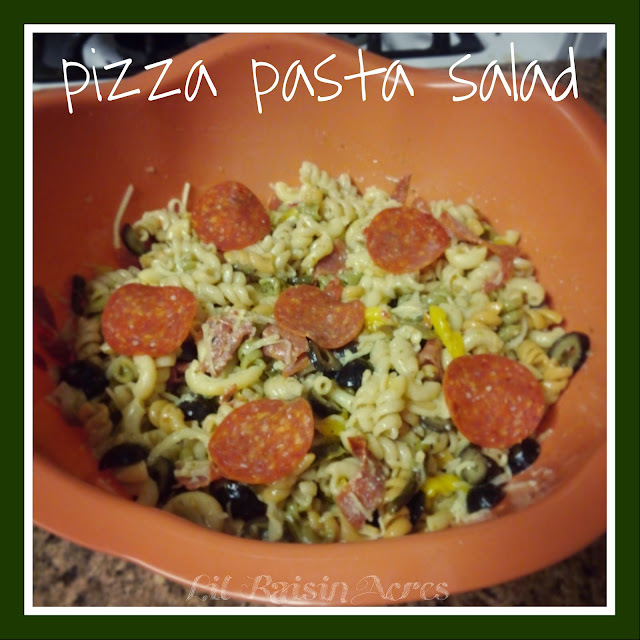 The American picnic food standard, the humble Pasta Salad. It can be prepared a number of ways- with a creamy sauce or an oil and vinegar based sauce, using elbow macaroni, or corkscrew pasta, or spaghetti noodles, and any variety of vegetables and/or meats! Low on cost, big on flavor, this zesty salad is sure to please! Cook noodles according to package directions, meanwhile whisk spice packets from salad kits into 1 c. dressing. Drain noodles and rinse with cold water. Combine noodles, dressing and remaining ingredients and refrigerate for at least 2 hours before serving. Serves 10-12 as a side dish. We've had one heck of a windy, rainy day here at Lil Raisin Acres. 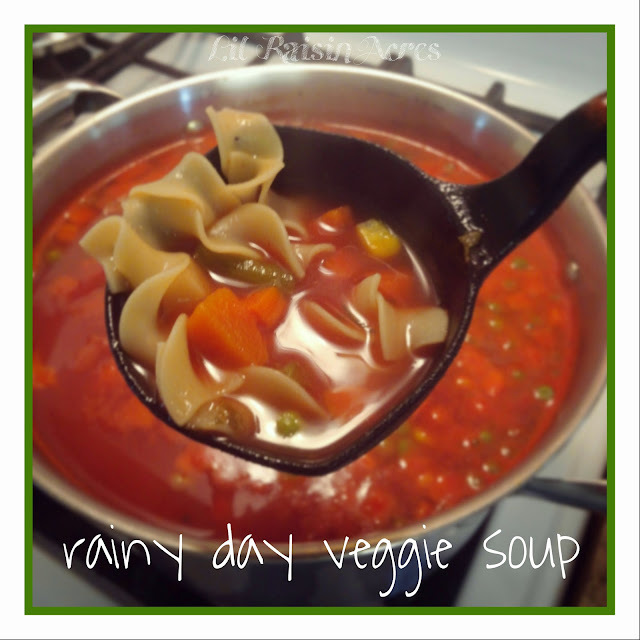 Here's a quick, simple soup recipe for those cool, rainy autumn days ahead. Utilize your home canned, frozen,and dehydrated harvest! Combine broth, juice, paste and spices (if your are using DEHYDRATED veggies, add them now as well). Bring to a boil, add noodles and frozen/canned veggies. Simmer for 10 minutes or until noodles are cooked. Remove bay leaf and serve. May be served with crackers or bread. There's a lot more to do with a dehydrator than dry herbs and make jerky! Preserve your harvest economically and create your own dry mix meals with the simple and hearty recipes contained in this tome of dehydrating knowledge! Although dehydration is an ages old method of food preservation, it's become a lost art for the most part with modern technology like refrigerators and freezers. But, what if we want to preserve more than will fit in our electric units, or we are travelling and won't have any access to electricity? This book will give you all the answers! The book opens with a discussion concerning the history and advantages of dry food preservation, the basic equipment you will need to get started, drying techniques, and storage of your products. Perhaps the most important portion of the book comes next, where you will find a detailed manual as to how to properly dry each individual herb, vegetable and fruit, as well as different types of meat. Proper drying method and time is essential in creating a viable final product that will store and reconstitute well. I've referred to this section of the book several times since I've had it. The book goes on to offer recipes for everyday meals, various types of jerky, portable dry mix camp meals, and other crafts and gifts like dried flowers. You can even use the dehydrator to make pet treats! It's actually quite convenient to use dehydrated vegetables in place of frozen in soups and stews. We store them in the pantry in glass jars, rather than taking up valuable freezer space, and there is no "freezer burn" to be concerned with for long-term storage! I found the dry mix trail meals to be of particular interest. They can be mixed and carried in a backpack in ziplock baggies, or put together ahead of time and stored in mylar bags or mason jars with oxygen absorbers. Just add boiling water, and you're ready to eat! BOTTOM LINE: 5 of 5 Stars. From beginner to expert, this book has a little something for everyone. It's an invaluable go-to reference book! Highly recommended for anyone interested in using dehydration for food preservation. A friend of mine is interested in purchasing a dehydrator and asked about the model I use. A lot of folks are under the assumption they need to spend hundreds of dollars to get into dehydrating. It's just not true! When purchasing a dehydrator, you will want to know the wattage of the unit you're looking at. The higher the wattage, the shorter the drying time will be, in general. It's a good idea to choose a unit that's AT LEAST 700 watts. The most important feature to look for in a dehydrator is an adjustable thermostat. If it doesn't have it, you're pretty much limited to fruits and vegetables and/or excessive drying time for jerky. Forget herbs, the pre-set temperature is much too high and will bake the scent and flavor right out of them. You will also want to choose an expandable unit, for which you can readily find additional stackable trays, screens and fruit roll inserts. If you intend on dehydrating corn, peas, chopped celery, and such, you MUST have screens, or else the vegetables will fall through the tray grates and fail to dry. 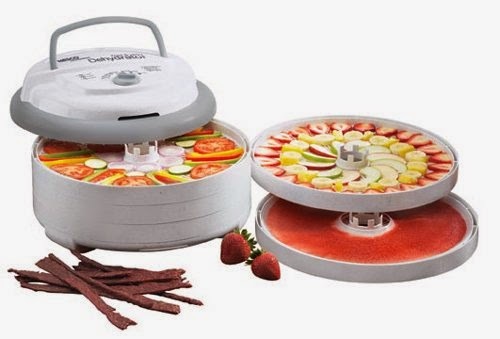 If at some point you wish to make your own dry mix camp meals, you will certainly want to be able to get "fruit roll" inserts to spread cooked rice, beans, or sauces on to dry. As the name implies, they are actually meant to make homemade "Fruit Roll-Ups". We have been extremely happy with our Nesco Snackmaster Pro Food Dehydrator . As the title says, it's a 700 watt unit, and it has an adjustable thermostat ranging from a low of 95 degrees for herbs, to 160 degrees for jerky. It comes with 5 plastic trays, but is expandable up to 13 trays. 2 screens and 2 fruit roll inserts are included. The additional trays, screens, and roll inserts are readily available at several online retailers, as well as in-store at Rural King and Cabela's (they are sold at Cabela's under the "Open Country" brand name). To operate, simply prepare your food stuffs, place them in the trays stacking as you go, place on the lid, set the thermostat, plug it in, and you're on your way! It's completely fool proof (that is unless you forget to blanch your potatoes first and they all turn black......). Most vegetables require no preparation other than slicing/dicing, although there are a few exceptions, such as those potatoes I mentioned. Fruit is usually sliced, then briefly soaked in a mixture of water with lemon juice to avoid browning. Small leaved herbs like Thyme and Globe Basil can be put in right on the stems, and removed after drying. Jerky is a little more complicated, but the flavor can't be beat compared to store brands! Dehydrating has gained popularity among gardeners and hunters in recent years. Home dehydrated goods can be stored in jars with oxygen absorber packets for a number of years without the use of electricity right in the pantry along with your home canned goods. There are even entire cookbooks now dedicated to creating dehydrated snacks, and entire meals from dehydrated ingredients. Look for that review later in the week! If you plan on dehydrating large batches of dozens of pounds of homegrown produce all summer/autumn long, you may want to go with a 1000-watt Gardenmaster , which is a little bit larger in circumference and will cut drying time by perhaps an hour or two per batch. It's been a cool, rainy October-like day thus far as I browse "Back to School" photos of my friends kids on Facebook. The kids in Michigan all return to school the week after Labor Day. It's hard to believe it is already the second day of September! We had quite a few fun excursions this summer, as well as completed a few projects like Deenis and Baa's new pen, and getting the lattice up under the front deck. In early June, we bought ourselves a pool, and went to see the Toledo Mudhens play with some of Brian's coworkers. We spent Independence Day and Labor Day with my brother's family at their camper, and went to three Fairs (Trenton, Blissfield and Lenawee Co.)! As a final hurrah, we're going to be going to Cedar Point in a few weeks. I still plan on getting "Pecker's Place" (the coop) painted FINALLY. 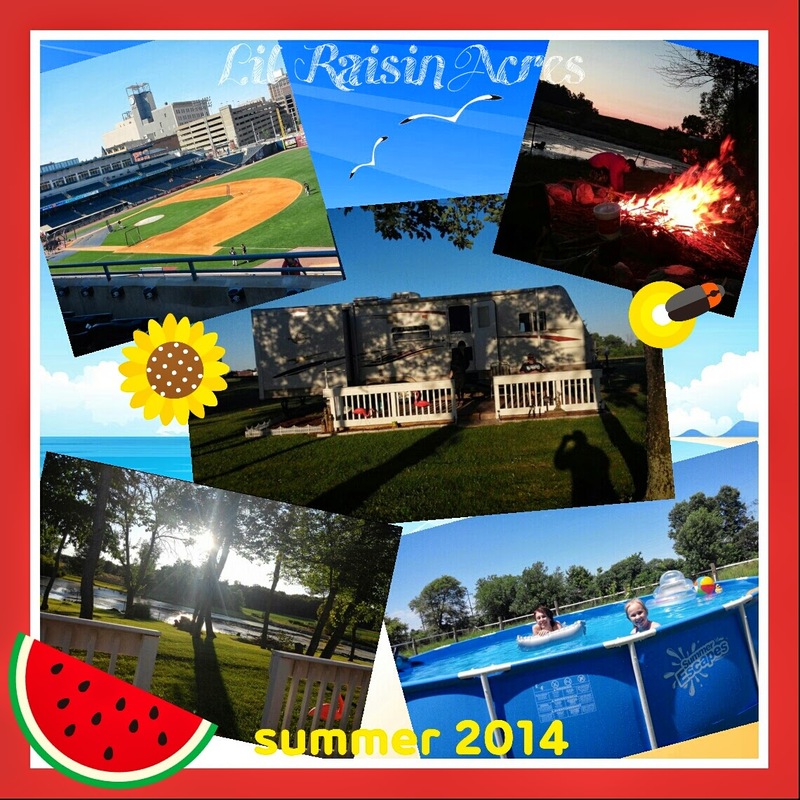 Weather wise, we had a very obscure summer here in Lenawee County. Abnormally cool, and extremely dry. I can count the number of days we hit 90 degrees on one hand. I remember my mom setting out a sprinkler and handing out popcicles to neighborhood kids all summer long when I was a kid. It was so hot and muggy you'd come home from the park for lunch soaked in sweat, as though you'd just jumped in a pool with your clothes on! This summer, we had some days in which I actually wore a fleece jacket and jeans out during the day! It was a rough gardening season for a lot of us, especially those without irrigation systems. I gave up on carrying gallon jugs out back around the third week of July. We had 60 tomato plants perish, as well as an extremely poor potato crop. The herb garden did well, however, as I was able to reach it with a hose. Our neighbor's corn and pepper fields died out anywhere his irrigation sprinklers didn't reach. It was so dry, in fact, that our new pool went unused throughout August due to water evaporating below the filter line. Now that we are receiving rain, it's too late! A rain catchment and irrigation system is something we should definitely add at some point in the near future.